Harry Stuart Culpepper and Alma Elaine Payne Ancestors, Culpepper/Payne Family Bible, Steven Edward Culpepper, owner, Sandy Springs, GA, (2005). Joe E. Craigmiles III, The Cemeteries of Thomas County, Georgia, Thomasville, GA: Craigmiles Historical Publications, 1990, Repository: LDS Family History Library - Salt Lake City, Call No. US/CAN Book 975.8984 V3c. Boston Cemetery, Behind Presbyterian Church, Boston, Thomas Co., GA.
+ Ruth Culpepper, 6 Jan 1887 – 19 Jun 1887. + Sue E. Culpepper, 25 Jun 1848 – 5 Jun 1887. Clabel Culpepper and John Bernard Law, Jr, W, (Date ?) Fulton Co., GA, Book 28-149. GA, Fulton Co., Atlanta, ED 134, page 7A; Ancestry.com image 13 of 32; Transcribed by Warren Culpepper. Ward 9, Block 93, Atlanta, Fulton Co., GA, page 181. Ancestry.com image transcribed by Warren Culpepper. Louise Culpepper and John Pierce Culver, W, (Date?) Fulton Co., GA, Book 28-247. + Allie Lee Culver, 11 Nov 1874 - 13 Feb 1950. 7 Jun 1923, Page 11. Clara S. Culpepper died 28 Jan 1955 in Houston Co., Alabama. P. l. Culpepper and Sarah Elizabeth Alford, 25 Jul 1870, Union Parish, LA. E-mail written 1999 - 2007 to Lew Griffin & Warren Culpepper from Donnis Louis 'Don' Culpepper (#52994), e-mail address. Culpepper, Son, M, S, W, 1M, LA/LA/GA. ED 50, sheet 17, ward 2. ED 141, sheet 12, line 93. E-mail written 2000 to Lew Griffin from James Jeffrey Culpepper, e-mail address. E-mail written Aug 2000 to e-mail address from Debi Antley Murphy. Mary Culpepper and John Antley, 3 Jun 1871, Union Parish, LA. Elijah Culpepper, SSon, M, S, W, 20, LA/AL/AL. C. A. Culpepper and Annie Bays, 24 Aug 1891, Claiborne Parish, LA. Amanda Culpepper married Charles H. Gates on 2 Jan 1869 in Clarke Co., Alabama. (At residence of brother, Lafayett Culpepper). Numbers in parentheses represent the person's number in this family tree. E-mail written Nov 2013 to Warren L. Culpepper from Joe Ed Tucker, e-mail address. My sister, Sondra Tucker has John's Bible and it just says John S. Green. Sydney is not mentioned as his middle name. It sounds logical and my grandfather Edward King Green mentioned the name Sidney but I don't think he was referring to John . John S. Green Descendants, John S. Green Family Bible, (Clarke Co., AL, 1861).http://gen.culpepper.com/archives/al/clarke.htm#Bible. Sarah C. Green born Sept 14, 1849. George L. Culpepper and Sarah C. Green, 4 Mar 1867. Sarah Ann Green died May 24th 1882. E-mail written 1995-2015 to Culpepper Connections from Linda Jones Cushing (#57676), 525 Summitbluff Dr, Greenville, SC, e-mail address. Henry Ulmer ( father of Anna Ulmer) b. 12 Mar 1856 in New Orleans, Orleans, LA and died in NOLA 06 May 1893 (New Orleans Birth and Death Index) buried in New Orleans Louisa St Cemetery. William D. Culpepper (25) and Anna Ulmer (18), 7 Sep 1897, Orleans Parish, LA, Vol 20, p 131. William George Culpepper, 3812 5th St., Meridian, Lauderdale Co., MS, Age 18, Born 4 Apr 1900, White, Motor Apprentice for NO&NE RR at NO&NE RR Shop, Meridian, Lauderdale Co., MS. Nearest relative: Anna Culpepper, Mother, 3812 5th St., Meridian, Lauderdale Co., MS, /s/ William George Culpepper, Tall height, Medium build, Brown eyes, Brown hair, No disabilities. Registered 12 Sep 1918 in Meridian, Lauderdale Co., MS.
William Culpepper, Son, M, Wh, 10, S, LA/LA. Austin Dee Culpepper, Cert 7716, Orange Co., FL, White, 28 Aug 1916 - 07 Jan 1991. William Doris Culpepper, 3812 5th St., Meridian, Lauderdale Co., MS, Age 45, Born 14 Oct 1872, White, Locomotive Engineer for NO&NE RR. Nearest relative: Anna Culpepper, Wife, 3812 5th St., Meridian, Lauderdale Co., MS, /s/ William Doris Culpepper, Medium height, Medium build, Brown eyes, Dark hair, No disabilities. Registered 12 Sep 1918 in Meridian, Lauderdale Co., MS.
C.C. Beard, Roomer, M, Wh, 26, sng, MS/MS/MS flagman RR. Augustine Schneider Ulmer (mother of Anna Ulmer) b 17 Oct 1859 in New Orleans, LA d 09 Sep 1928 in NOLA (New Orleans Birth and Death Index) buried in New Orleans, Louisa St Cem. Austin Culpepper, Son, M, Wh, 13, sng, MS/AL/LA. Anna Maria Ulmer born 29 Jun 1879 New Orleans, Orleans, LA ( New Orleans Birth Index vol. 74:71) And died in Meridian, Lauderdale, MS on 30 Jul 1950. She & Wm Doris buried in Magnolia Cem. in Meridian, MS.
Claude Culpepper, Lodger, Wh, M, April 1878, 22, S, AL/AL/AL. 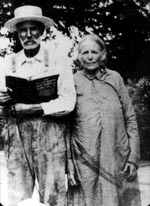 Claud Culpepper and Mattie Ruffer married 26 Dec 1900 in Lauderdale Co., MS.
Sam Cohn, Boarder, M, 70, wid, Germany Ger Ger. Claude Culpepper, 803 E. Grand Ave., Marshall, Texas, age 40, born 20 Mar 1878, Caucasian, RR Conductor for the T&P Railroad in Marshall, Texas, Nearest relative: Mattie Culpepper, Marshall, Texas, Tall height, Stout build, Blue eyes, Brown hair, No disabilities. Registered 11 Sep 1918 at Marshall, Harrison Co., Texas. Louis Culpepper, Son, M, 15, S, MS US MS.
Lucile R. Culpepper, Dau-in-law, F, 19, M, md@19, LA/LA/LA, Not employed. C. H. Culpepper, 25 Dec 1940, 64 Years, Natchitoches Parish, LA. Lena Culpepper and Frank D. Fabre, 27 Jun 1908, Orleans Parish, LA, Vol 30, p 334. Katie Culpepper, Daughter, Wh, F, Sep 1894, 5, sng, AL/AL/AL. Lena Culpepper, 9 Apr 1933, 44 yrs, White, Vol 2010, p 204.
daughter of William and Anna Ulmer Culpepper, Vol 113, p 603. Find A Grave Memorial# 71881075. Find A Grave Memorial# 71881159. Mississippi Sgt. Co. F 114 Sup TN 39 Div W W.
Augusta Culpepper, Daughter, F, Wh, 5, sng, MS/LA/MS. Nina B. Culpepper, Cert 54942, Orange Co., FL, White, 01 Jun 1917 - 12 May 1991. Sara Buffkin, 21, F, SC. Alie S. Culpepper, Son, M, Sng, Wh, 2, N/A, MS/MS/MS. Adine Culpepper, Daughter, Wh, F, July 1889, 10, S, MS/AL/MS, at school. E-mail written Feb 2007 to Warren Culpepper from Mary Ashcraft Watts, Frankfort, KY, e-mail address.